Call of Duty, one of the most celebrated video games, recently released their fourteenth installment in the Call of Duty Series. The title of the game is Call of Duty: WWII. It is the first Call of Duty game set in the World War II time period since Call of Duty World at War. The game is centered around the men in the 1st Infantry Division. The game follows their battles on the Western Front and shows the historical events that occurred in Operation Overlord. Photo Courtesy of Activision Publishing, Inc. 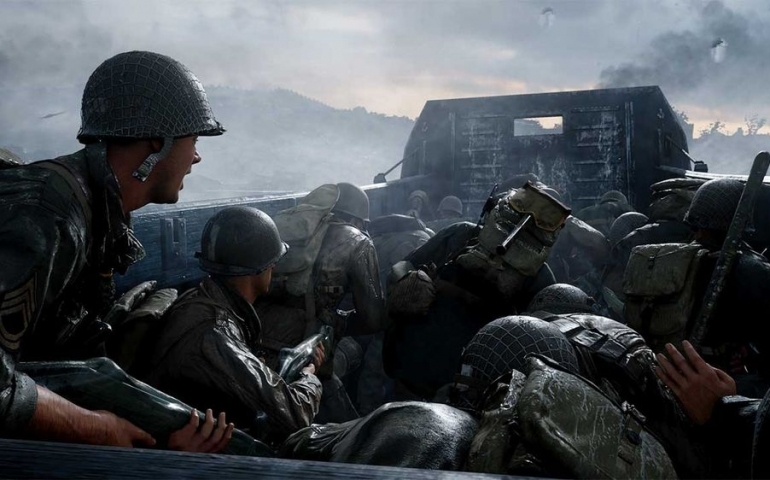 Many fans and critics appreciate the return to the World War II setting. Critics see it as a return to the roots in which the game started. The new game gets rid of the advanced movement system that we have seen in the last two Call of Duty games, such as, double jumping and wall running. It features the return of the more traditional, “boots on the ground” gameplay. Fans of the game have praised the return of the more simple and basic movements and feel of the game. The campaign is the first to not feature health regeneration since Call of Duty: The Big Red One, which was released in 2005. The campaign of the game is done really well. The campaign story is touching. It showcases the brotherhood that is established in war very well. During battles, you struggle side by side with someone who you don’t even know that well, and this game shows a realistic take on the way this occurs in real life. The campaign does feel a bit taxing with how you are going through the same motions with standard guns. But the campaign is still done extremely well. The multiplayer is one of the favorite parts of the game from critics and fans alike. On the online multiplayer feature of the game, you are assigned to the Axis or Allied side. If you are on the Allies team, you are allowed to pick from American, British or French Resistance, and if you are on the Axis, you are a German. Instead of creating a class, like in previous games, you are allowed to choose from one of the five divisions. This is a very welcomed change. It is very nice to see a franchise as successful as Call of Duty to try this. The new game mode, War, which is a personal favorite of mine, is a narrative driven multiplayer mode. This game mode is extremely fun and should be one of the first things you try with friends. Lastly, there is just about every college student’s favorite part of Call of Duty and that is Zombies. Landon Walker, student at Southern Nazarene University, says “Zombies is the best part of the game”. Zombies is once again a standout part of the game. It perfectly navigates a path for ultra fans of zombies and just the casual person that will play Zombies. The looks and visuals for Zombies are even better. The dense atmosphere and even scarier zombies create one of the best zombies game modes yet. Stevie Jackson, says “You should absolutely buy the new Call of Duty Game.” Stripping all the fluff away from the game created the best Call of Duty games in recent years. Making the game simpler and bringing it back to the roots was the right call for Call of Duty, and I can’t wait for the next game in this storied franchise!